The Mongols were nomadic people who lived north of China. Mongol raids into China caused a great deal of destruction during the Age of Warring States. In 214BCE, when Shih Haung-ti unified China and began the Ch’in Dynasty, he decided to end the Mongol threat by constructing one of the largest public works projects in history. 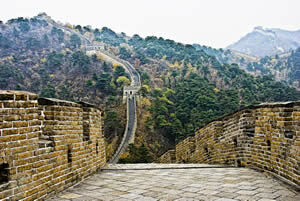 To this day, the Great Wall of China is the longest human-made structure on earth. More than a million Chinese workers connected a number of existing defensive walls into a single system fortified by watchtowers in order to keep out the Mongols. Very little remains of the original construction, but later rulers made the wall stronger and longer. Today the Great Wall of China stretches more than 1,500 miles. The wall is generally twenty-five feet high with forty-foot towers. It is wide enough for wagons to pass each other in opposite directions. If a 1,500 mile wall began in Miami, Florida, it might end in Boston, Massachusetts, Des Moines, Iowa, Oklahoma City, Oklahoma, or San Antonio, Texas. Gates through the wall became centers of trade and contact with the northern nomads. Ironically, the Song Dynasty fell to Mongol invaders from northeast China when a traitor opened a gate in the wall. Many people believe that the Great Wall of China can be seen from the moon without a telescope, in fact, a question in the game Trivial Pursuit says as much. Astronaut Alan Bean has been on the moon and said otherwise. –Quoted in More Misinformation (1980) Malcolm Yapp (Greenhaven Press, Inc.). 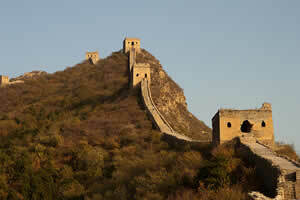 The Great Wall of China is a series of fortifications made of brick, stone, tamped earth, wood, and other materials. It has become the primary icon of Chinese culture. 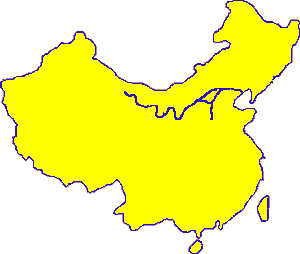 The Great Wall is outlined in blue on this map of modern China. Many parts of the Great Wall are wide enough for wagons to pass each other in opposite directions.